Last week, my new friend Neil McNerney tagged me in a fantastic project called The Next Big Thing Online Event. The Next Big Thing is a way for authors and bloggers to share the news about their most exciting upcoming projects. The goal is to share information about a big project, and then share the love by paying it forward to a few other authors and bloggers. Please take a minute to look at the end of this post to see the incredible and diverse group of folks I invited to play along. All of them are doing some great things. Also check out Neil’s Next Big Thing… if you have a student you want to make sure to check out what Neil is up to! SO WHAT IS MY NEXT BIG THING? My project kind of fell into my lap. You see I went to a workshop at my son’s school to hear speaker, parenting expert,author and licensed counselor Neil McNerney lecture on Homework and how to help your kids with it without Freaking Out. I was so impressed with this man, that I bought his book and read the entire thing in one night. It is a quick read and Neil has such a warm witty personality that just pops off the pages. The entire time I was reading the book I just kept thinking that this format, this quick read and positive uplifting type of “You can do this” book would be great for parents of kids with Aspergers. So I contacted Neil and told him all this and we met and well next thing I know I am agreeing to co-WRITE the book! Me Write the book! I am beyond thrilled and very intimidated at the same time. You see I desperately want to write something I am proud to put out there. Something that will assure parents they are not alone and give them tools to better understand, interact and make things a little easier for their children with Aspergers . We hope to have the book available for purchase in the Spring but I am not rushing this. I am picking and choosing the words I am putting down on those pages because I know just how big an impact they can have! Words like Cure, Tragedy and Burden will NOT be in it. Our book will have different words like Hope, Compassion and Acceptance!!! What will make this book even more different than others that are out there is that not only will you get a parent’s perspective and a professional’s point of view…you will have insight from adult Aspies. This is the part I am most excited about. Real folks with Aspergers who have graciously agreed to talk with me and give me insights into the way that their brilliant beautiful minds work and I am going to share these insights with you!!! So there you have it. 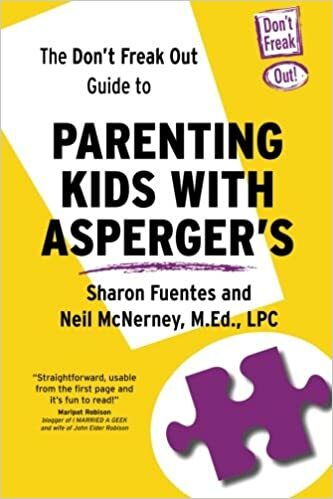 “The Parent’s Don’t Freak Out Guide to Aspergers” book hopefully coming to Amazon and Barnes and Noble very soon!! Now to tell you a little about the wonderful author/blogger friends of mine whom I am passing the torch on to. Here they are, in no particular order as they all deserve to be NUMBER ONE!!! Make sure to check out their links to learn more about their NEXT BIG THING! Alyssa– Alyssa is a 20-year-old Autistic college student. She blogs at Yes, That Too and studies mathematics, mechanical engineering, and Chinese. While a relative newcomer to the Autistic community, she contributed “I Hid” to the Loud Hands Project and was one of the moderators for the most recent Autistics Speaking Day, plus she hangs out on Facebook and Twitter. Her NEXT BIG THING is a compilation of poems and essays into a book, which has a working title of “With a Capital A.” Many of the intended essays and poems can be found on her blog, though certainly not all- there does need to be a reason to buy the book, after all! Isobella Jade- Author Isobella’s NEXT BIG THING is Quiet, the second book of her Careful, Quiet, Invisible series for Young Adult/Teens. The series is told through the spirit of a teen girl who dies in a texting and driving crash and is all about how she comes to grips with her own death while discovering the secrets of her friends and loved ones that she left behind which test the power of friendship and trust. Isobella says the series is sort of Lovely Bones meets Sisterhood of the Traveling Pants with some edge found in Pretty Little Liars.Find out more about the Careful, Quiet, Invisible series and watch the book trailer here: www.isobelladreams.com. Find Isobella Jade on Facebook here: https://www.facebook.com/isobella.jade and on Twitter here: www.twitter.com/isobellajade. Courtney B. is a mother of a 6 year old boy with autism who is on a mission to make sure that there are services and sensory friendly activities in her community. Because of Courtney, her town will have their FIRST Sensitive Santa this year!!! She also has worked to have sensory friendly movies and her NEXT BIG THING is trying to get Equestrian therapy in her area for her son and the other ASD kids in her local support group. You can find this warrior MAMA on facebook at A Legion For Liam. She also blogs at: http://myausomeson.blogspot.com/. Kerrie McLoughlin -is a homeschooling mama of 5 amazing kids who has written for over 110 regional parenting magazines since 2009. A Kansas City native, she is also the author/compiler of the ebook “Get Published in Parenting and Family Magazines: Make Money to Write About Your Kids“. Kerrie is a wealth of knowledge and if you are considering trying to break into the family magazine writing business… well you got to check out her site!You can find her author site, complete with reprint list, here and her humorous life blog is at TheKerrieShow.com. I cannot wait for your book. It will be fantastic!! !